Northern Ireland's Jonathan Rea says his record-breaking third straight World Superbike title success is yet to sink in. Triple World Superbike champion Jonathan Rea says his history-making three-in-a-row feat is the stuff of dreams after the Ulster rider got the job done in France today. 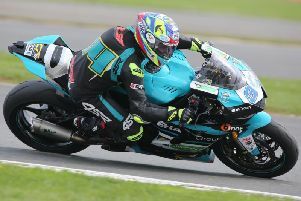 The Kawasaki rider obliterated the opposition to win in the wet by over 16 seconds from Ducati’s Marco Melandri, with Tom Sykes third on the second of the KRT machines. Jonathan Rea has written his name into the World Superbike Championship history books. Rea has joined Aussie Superbike legend Troy Bayliss on three World Superbike titles, but the 30-year-old is the first rider ever to be crowned champion in three successive seasons. “It’s not hit me yet,” Rea said. “I dreamt of one world championship as a kid and it was all I held onto through all the sacrifices made by my parents in the motocross days, working towards a goal like that. “To get one was incredible and then back-to-back titles with the new bike was unbelievable, but this one’s incredible – I’ve no words really. “This year has been unbelievable so far and the bike has been working really good. I feel like it’s matching my style a little bit more now and I’m lost for words,” he added. Rea has sewn up the championship ahead of Sunday’s second race at Magny-Cours and with two rounds remaining in October and November, at Jerez in Spain and Losail in Qatar. The Ballyclare man has won 12 races this year and has now increased his tally of World Superbike victories to 50.